This Bag was inspired from the well known Native American Indian “The Tale of Two Wolves”. This famous bag graced the pages of Vogue and was created for Jane Herman, the editor who wrote the article for The Gentlemen’s League. 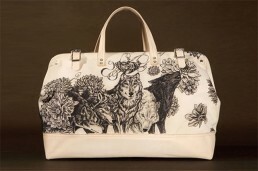 On the front, the bag has her favorite animal and flower, wolves and dahlias. Jane is a Gemini, on the back, you will find 2 portraits of Jane back to back, one version of her the dark and one of her the light. The rope symbol is in large scale, is the symbol for Gemini, Bag 009.